If I were the CEO of Reader’s Cricket Balls, I would want every game to be played at Nag’s Head Meadow! The Rickmansworth Sunday team duly assembled for our annual outing to Great Missenden Pelicans, looking just to get a game in after all the recent bad weather and abandoned matches. 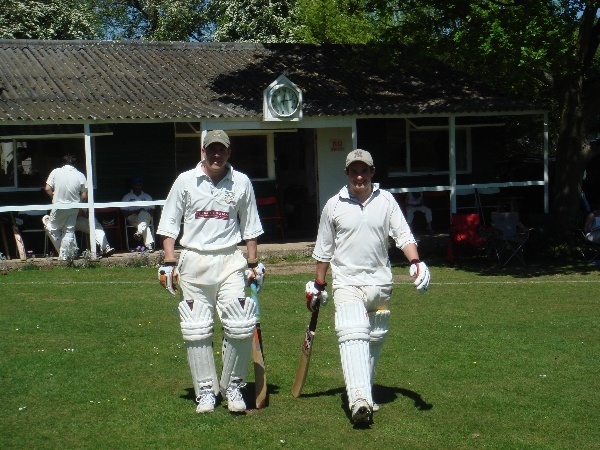 The usual ‘make it up as you go along’ rules applied for this friendly, and a combination of admin (Jon Wood) and on-field skippering (Phil Riddleston) meant that we got a game in in the picturesque countryside. We won the toss and opted to bowl, on a pitch that looked like it would deteriorate quite quickly. The plan was straightforward…keep everybody engaged in the game, and anybody who wants to, gets to bowl. We all did (apart from Ken, who was resolute behind the stumps). The home team's opening pair were quickly into their game and clearly understood how to play the game at their home ground. They put on over 100 for the first wicket which finally came courtesy of a fine caught and bowled by Roshan. The struggle continued however, and they continued to pile up runs, and dispatch balls to various parts of the surrounding thick undergrowth, prompting the home skipper to go scurrying for replacements on a regular basis. Runs kept coming, and we kept trying, but we didn’t (sadly) get their new Zinger bails to flash for us. We eventually got them 5 down for 219, with a couple of very fine catches in the deep (Messrs Riddleston and Abraham) and a great running catch from the exuberant Joe Monk. As the saying goes, anything you can do, I can do better, and in came Waqqas to open our response. It didn’t take long for balls to go flying in all directions, hit with much gusto (and a certain style) to all parts. The Chiltern Line and the Nag’s Head pub are now the proud owners of a number of partly used cricket balls, along with even more consigned to the undergrowth. Waqqas showed no sign of slowing down, and continued to dispatch everything everwhere. Problem was, nobody could stay with him long enough to keep him company. A couple of rash wafts outside off, a couple of dollies to the fielders and a couple of balls that were simply too good saw the Ricky response crumble to 101 all out. Between both teams, I reckon we got through about 7 or 8 balls during the game. Judging by the home team’s preparedness for this, it must be quite a common occurrence. As is always the case at the Pelicans, fun game at a beautiful location against a nice bunch of lads – what’s not to like?